Bagillt, in North Wales is a large thriving village in the township	of Bagillt Fawr and Bagillt Fechan in the parish and Union of	Holywell, situated about 2 mile from the town of Holywell, and the same distance from Flint. Here are extensive lead works, collieries, chemical works, and a brewery, also a railway station on the Chester-Holyhead line, and a quay on the River Dee. Bagillt History Web Site is run by the people of Bagillt for the people of our village or anyone world wide who has connections with Bagillt. Please feel free to contact us if we can help you with your research on Bagillt or you have information, photographs, etc. you think may be of interest to us. As a club we meet on the First Thursday of the Month, 7pm to 9pm, at Beechcroft House next to theBowling Green , Bagillt. Our aim is for like minded people who are interested in the History of Bagillt to come together to enjoy and share their memories of days gone by. 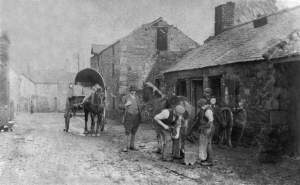 We hold a large collection of old Photographs of Bagillt and its people and, with the help of computers, we can now show them on the big screen to our members. On alterative months we have guest speakers covering a variety of subjects (when ever possible, all with Bagillt connections). The club has a selection of publications available and it is hoped in the near future to have a new book "Bagillt Through The Ages - 2nd addition". Bagillt History Club members would love to hear from you. 1952. Mrs Anderton's. 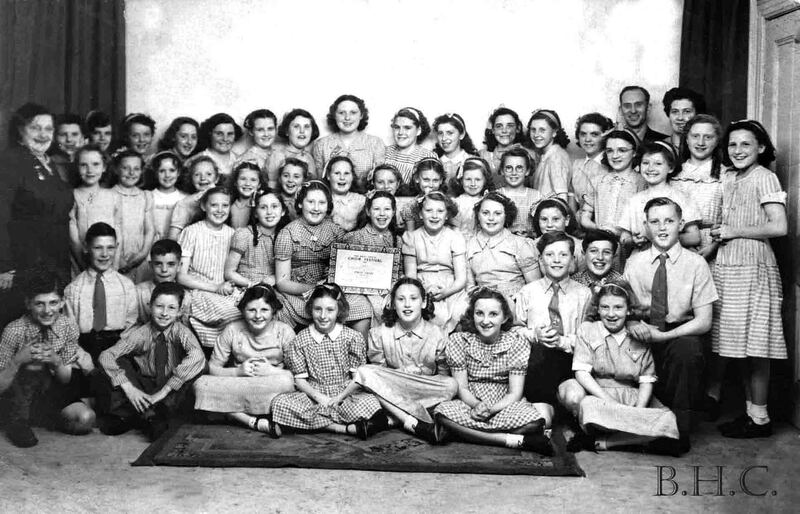 Bagillt Junior Choir. Mr Emlyn Round passed away on Friday 26th August2011. Aged 72.
and through the wonders of the internet contact was made with the Bagillt History Club. and along with his good friend Gwerfyl Richards. met the committee of the Victoria Welsh Society asking for the return of the chair to Bagillt. How could they resist the charms of a true Bagilltonian. His request for the chairs return was granted. The rest is history, after the Celebratory return of the chair with villagers filling St Mary,s Church to the brim, the chair now rests in its home village for all to see. The story of the 118 year old Bagillt Eisteddfod Chair found in Canada and returned to its home village of Bagillt in North Wales. News on Wales website USA. From there on it was picked up by the media with the story of the chairs return seen, heard, and printed in news papers around the world. The Bagillt Eisteddfod Chair again recieved recognition at the Welsh National Eisteddfod, held in Mold , North Wales. Where it again appeared on television, with the story told on the radio to the people of the UK. In September 2007 the 118 year old chair was displayed along side the 2007 Eisteddfod chair in the town of Ruthin, North Wales, for their Heritage Weekend . Unit 2. Ffordd yr Onnen. Lon parcwr. Ruthin. Born at Castell Hen Blas, Bagillt. A part of Bagillt’s History becomes a major tourist attraction. For many years villagers of Bagillt believed the Famous laxey wheel in the IOM It was made in Bagillt by the Hawarden Iron Works, Boot End, Bagillt. St Mary's Church as photo..
A very important part of the village in its time. Station Road with it level crossing in foreground. Blossoms Hotel looking towards centre of village. The Parrot School, Unique to Bagillt. Bagillt History Clubs First Publication. Full of History, facts & Pictures of our Village. 60 Pages. Stories and facts about Bagillt's seafaring people from Local Fishermen to Sea Captains. 36 pages. The 1920's reflections of Bagillt was such a success Mrs Meese put pen to paper and wrote this follow up book. 42 Pages. 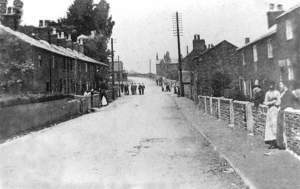 A nice collection of story's of village life and its people in the 1920's and 30's. 20 pages. A book on the history of this school, with lots of pictures, records, and Reports. Also the story of the time capsule placed in the new Glan Aber School. 58 Pages. In this booklet there are lots of snippets of stories about the village and its people as overheard by the lather boys in the village barber Shop. This building is truly a giant, The grand old man. Words used to describe this dominant building in the centre of the village. Booklet tells of its History. 16 Pages. Booklet tells of 1889 Eisteddfod held in Bagillt. Goes on to say its pavilion was the first in Wales to be lit by electric light. LEAD..The most authentic records of the lead refining industry In Bagillt are probably those relating to the Gadlys Works, But there is every reason to suppose that lead refining was practiced long before the erection of this famous works. COAL...At different times throughout the 19th century, there were at least 11 known coal pits in Bagillt. Bettisfield being the most dominant. DOCKS on the River Dee..It is more than likely that small Fishing boats had been using the Bagillt mark or gully for centuries. It was not really until the coming of industry In the 18th century that Bagillt developed as a small port With several busy quays. RAILWAY.. The railway age dawned in Bagillt on May The 1st, 1848, when the Chester and Holyhead railway opened to traffic. The local industries of lead smelting, coal mining, iron founding, which had relied on the wharves and the jetties along the river Dee as there sole means of transport.. PLACES OF WORSHIP.. In a church census in 1851, The following where listed, Bethania, Wesleyan Methodist, built 1801; Bethel, Baptist, built 1818; Ebenezer, Wesleyan Methodist, built 1915; Smyrna, Independent, built 1801; Tabernacle, Calvanistic Methodist, built 1841. St Mary,s Parish Church. 1844..
SCHOOLS.. Bagillt had two principal schools in 1846 The National or Church School and the British School Run by the nonconformists. ROPE making.. The rope walk, at the beginning of the 19th Century, was considered the longest in Britain. Welsh Society in British Columbia, Canada.